Most people have a genuine interest in living the best life possible. For many of us, this includes taking proactive measures to protect ourselves from the effects of aging and disease. In the United States, we often turn to modern medicine to stay healthy and treat ailments as they occur. Modern medicine offers tremendous benefits to our society. However, people are also growing tired of the side effects of modern pharmaceuticals. In response, more people are turning to age-old natural remedies — such as ginseng — to support their health. It is suggested that Panax ginseng was discovered in China over 5,000 years ago. The root, which was originally utilized as a source of food, quickly became well-reputed for its medicinal qualities. Fast forward several millennia to the 1990s and the demand for ginseng as a medicinal herb had grown so dramatically that it was necessary to move away from wild ginseng and toward commercial cultivation. Today, ginseng is one of the most used natural products in the world. Estimates show that around 1.8 million adults in the United States use some form of a ginseng supplement. Ginseng ranks among the top 10 most consumed supplements, sandwiched between garlic supplements and ginkgo biloba (x). What is it about ginseng root extract that has earned the trust of millions of people over centuries of use? 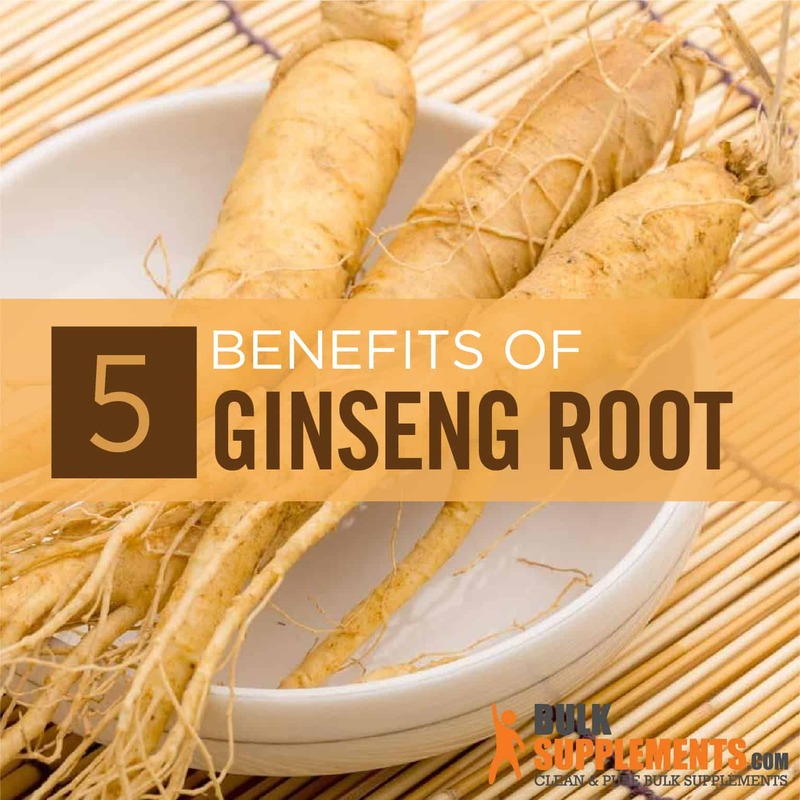 Here is what you need to know about ginseng root extract, the benefits and cautions to pay attention to. An important ginseng benefit is its ability to quash inflammation before it has the chance to do any long-lasting damage. Until recently, the evidence of this had been mostly anecdotal. However, science is now backing up the claim. Researchers at the University of Hong Kong identified nine different constituents in ginseng called ginsenosides, which have varying levels of immunological activity. Of these nine ginsenosides, seven were capable of inhibiting the expression of a specific inflammatory gene (x). Additional research has also shown that ginseng can be beneficial in reducing inflammation that occurs as a response to a variety of physical conditions. This includes the inflammatory effect that binge drinking produces within the liver (x, x). Panax ginseng can improve concentration and cognitive function by stimulating brain cells. A combination of human trials and research conducted on animal subjects supports this theory (x). For instance, we’ve seen through research that certain compounds in ginseng have positive effects on neurotransmission and neuroprotection. More specifically, compound K may offer protection against neurodegenerative diseases in healthy populations (x, x). Results like these demonstrate that ginseng has the potential to be effective in the long-term protection of cognitive function. The effects of ginseng on cognitive health extend past its long-term protective qualities. Ginseng can reportedly improve memory, focus and alleviate mental fatigue. It can also improve various aspects of mental health and social functioning after several weeks of treatment (x, x). Is a sluggish metabolism keeping you from reaching your weight loss goals? Adding ginseng to your daily routine could be the solution to your weight loss challenges. Initially, ginseng revs up the metabolism and provides a nice energy boost to help you power through your workouts. However, there is a lot that is happening behind the scenes on a cellular level to support these processes. A review of multiple studies showed that Panax ginseng can inhibit weight gain. It may also improve serum lipid profiles (x). On the cellular level, ginseng produces an anti-obesity and anti-adipogenic effect by inhibiting lipogenesis, which is the metabolic formation of fatty tissue. Through this process, it lowers cellular lipid content as well as adipose weight (x). Combined, all of this makes ginseng an effective supplement for promoting a healthy, active lifestyle. Ginseng has a centuries-old reputation of being a powerful aphrodisiac. Many have even claimed that the human-like form of the root of the ginseng plant is representative of male virility. Folklore is entertaining, but is there any actual scientific evidence to back this up? The answer is yes. A systematic review of ginseng included a meta-analysis of data that supports the theory that ginseng can treat erectile dysfunction (x). Additionally, research has been conducted on the effect of ginseng on women’s sexual health. Through oral consumption, Korean red ginseng did appear to improve sexual function in premenopausal women. However, some researchers argue that a placebo effect may have played a role in the results. More research is necessary before making further claims (x). Cancer is one of the most devastating diseases we face today. While major advancements in research have taken place, we are still currently without a cure. New treatments, such as gene therapy and immunotherapy, have been added to the treatment options for many types of cancer with impressive results. Still, cancer is a serious disease and is the second leading cause of death in the United States (x). While we don’t have a magic bullet for the treatment of cancer, there are things we can do help prevent cancer from developing. We know that there are many foods and supplements that offer some preventative qualities against cancer, one of which is ginseng powder. Ginseng root, when taken regularly, may have an anticarcinogenic effect in the body in regard to certain types of cancer, including lung, ovarian, liver, colon, oral and stomach malignancies (x). Ginseng root extract works to potentially prevent cancer through a number of different mechanisms, such as reducing inflammation – which is a common precursor to tumor development – and slows down cancerous cell proliferation by inhibiting tumor related angiogenesis. While many of us associate ginseng with eastern herbal medicine, there are actually several different types of the ginseng plant. These include Korean ginseng, which we also refer to as panax ginseng, and American ginseng. These two varieties combined make ginseng one of the most popular herbal supplements in the world. If you’re interested in taking ginseng, it’s important to have at least a basic understanding of the differences between the most common varieties of the plant. For instance, Asian ginseng is considered a warming supplement. The American variety, however, is known more for its cooling properties (x). Both of these varieties contain different proportions of ginsenosides — steroid glycosides and triterpene saponins that are found almost exclusively in plants belonging to the ginseng family. People often confuse ginseng and ginger. After all, both are roots, their names are similar and they can both produce feelings of warmth and invigoration. It’s important to note, however, that there are some major differences when it comes to ginseng vs. ginger. While the two plants are similar in appearance, their medicinal properties are quite different. For instance, ginger is warming, but it’s also well-known for its role in relieving digestive distress. This is especially true in people who might not otherwise be able to tolerate pharmaceutical digestive aids. Ginseng, on the other hand, is an adaptogen, which is a substance that helps the body respond to various types of stress by enhancing a state of nonspecific resistance within the body (x). This is especially crucial for supporting immune health and battling cellular fatigue. Although it can be a little challenging to find, the ginseng root can be purchased whole for consumption. While having a slightly bitter taste, the root can be softened through steaming or by steeping in teas. Some people also use the ginseng root as a staple in certain types of dishes, such as stir-fries. That said, most people who consume ginseng for medicinal purposes prefer to take it as a supplement in the form of a powder, capsule or oil. While the reported ginseng side effects with typical usage are relatively minor, taking too much ginseng or continuing supplementation for a prolonged period of time without cycling off of it can lead to ginseng abuse syndrome. Symptoms of ginseng abuse syndrome include elevated blood pressure, sleeplessness, enhanced nervousness, fluid retention, skin lesions and changes in bowel patterns (x). Ginseng is safe for most people when used for short periods of time or with a regular cycling routine. Reported side effects are rare, but may include headache, rapid heart rate, changes in blood pressure, insomnia, breast tenderness and, in some cases, allergic reaction (x). You should seek emergency medical assistance if you develop a reaction that involves swelling of the lips, tongue, throat or eyes, especially if it is followed or accompanied by a red or purple skin rash. It is best that pregnant women abstain from taking ginseng supplements until after they give birth. There is currently not enough information available on the safety of ginseng supplements when used by breastfeeding mothers. Therefore, it is suggested that breastfeeding women not take ginseng or discuss the risk/benefit profile with their health care providers before doing so (x). It is also best that you use caution and discuss ginseng use with your health care provider if you have certain health conditions. These health conditions include autoimmune disorders, heart disease, diabetes, hormone sensitive health conditions, insomnia, organ transplant patients or people diagnosed with schizophrenia. The recommended dosage of ginseng root depends on the type of preparation and if there is a specific reason for using ginseng for medicinal purposes. Some suggest taking 1 to 2 g of dried ginseng root daily for up to three months. Other sources recommend taking 200 to 400 mg daily for maintenance. If you are using ginseng to treat a specific medical condition, it is best to discuss with your doctor what is appropriate for your needs and how long to maintain treatment. Long-term use of ginseng in maintenance dosages is generally safe as long as the person taking the supplement adheres to a schedule where they periodically cycle off of ginseng. For example, refraining from taking any supplement or product containing ginseng for a two-week period following 2 to 3 weeks of daily use (x). Periodically cycling off ginseng when using the supplement long term will help to prevent the occurrence of symptoms related to ginseng abuse syndrome. While no supplement can serve as a replacement for living a healthy lifestyle, ginseng root extract is one that has many proven benefits when used by otherwise healthy individuals. Ginseng has been in use for thousands of years, and throughout this time, we have a recorded history of its many medicinal benefits. Today, we also have the benefit of dedicated scientific study to back up the healthy effects of adding ginseng root extract to your regular routine. If you’re looking for a supplement that increases energy, focus and supports your health on many levels, ginseng is a wonderful, natural solution.